"The findings are exciting because we were able to perform a series of complex chemical transformations that usually require high-energy, visible light using a noninvasive, infrared light source," said Tomislav Rovis, professor of chemistry at Columbia and co-author of the study. "One can imagine many potential applications where barriers are in the way to controlling matter. For example, the research holds promise for enhancing the reach and effectiveness of photodynamic therapy, whose full potential for managing cancer has yet to be realized." "With this technology, we were able to fine-tune infrared light to the necessary, longer wavelengths that allowed us to noninvasively pass through a wide range of barriers, such as paper, plastic molds, blood and tissue," Campos said. 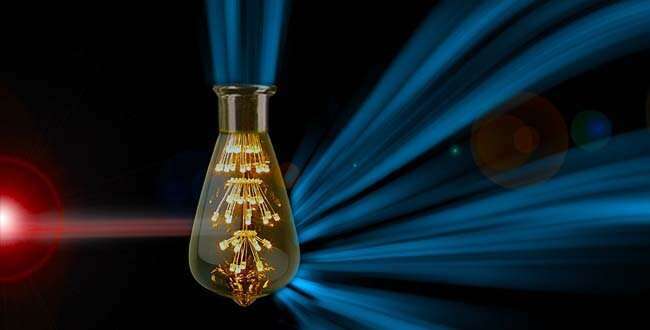 The researchers even pulsed light through two strips of bacon wrapped around a flask. Current photodynamic therapy is limited to the treatment of localized or surface cancers. "This new technology could bring PDT into areas of the body that were previously inaccessible," Rovis said. "Rather than poisoning the entire body with a drug that causes the death of malignant cells and healthy cells, a nontoxic drug combined with infrared light could selectively target the tumor site and irradiate cancer cells." The researchers are currently testing photon-upconversion technologies in additional biological systems. "This opens up unprecedented opportunities to change the way light interacts with living organisms," Campos said. "Right now we are employing upconversion techniques for tissue engineering and drug delivery." Could this be used to limit radiation damage to astronauts? The headline & article appear contradictory. Bret, I'm not sure of how this process would be of use to protect astronauts from hard radiation? That a few layers of gold foil around the habitat wouldn't do better? If I understand the abstract correct;y this process is more of an ultra-modern version of the old fluoroscope? With additional ability to blast tumors without poisoning other internal organs. IR upconversion is old. It was used rather commonly in the 1960s to product visible light from rather efficient (even by today's standards) IR LEDs and laser diodes. The real issue is that there is a thermodynamic limit on the efficiency of the upconversion process. Ionizing radiation is based on short wavelengths. Could it made into a paint that would covert IR capture by greenhouse gases to Visible for which the atmosphere is tranparent?